Making confident farm management decisions is hard with volatile commodity prices. Unfortunately, volatility is inherent in markets that are driven by supply and demand. Farming is a prime example of this type of cyclical market. Today’s farmer needs to find a system to help filter through the prediction focused-noise and our human tendency to fixate on the recent past. Most will agree with this philosophy but we still get stuck on the emotional roller coaster of financial markets. This is especially true in commodity markets where increaed demand/prices lead to increased supply. This is the definition of a cyclical industry such as farming. The price reactions to the changes in supply and demand can be swift. It’s human nature to get complacent during times of high prices and become overburdened with “doom and gloom” during periods of low prices. 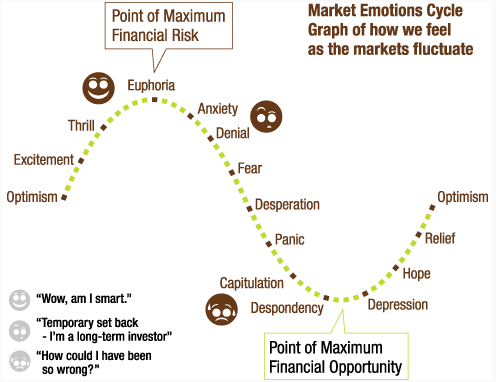 **A key aspect of successful farm risk management is fighting these emotions. Futhermore, we as humans tend to suffer from recency bias. This bias is best explained by the following exerpt from the New York Times. Even in a market that everyone knows displays strong tendencies of being cyclical, such as farming, it’s hard to look beyond the recent past. 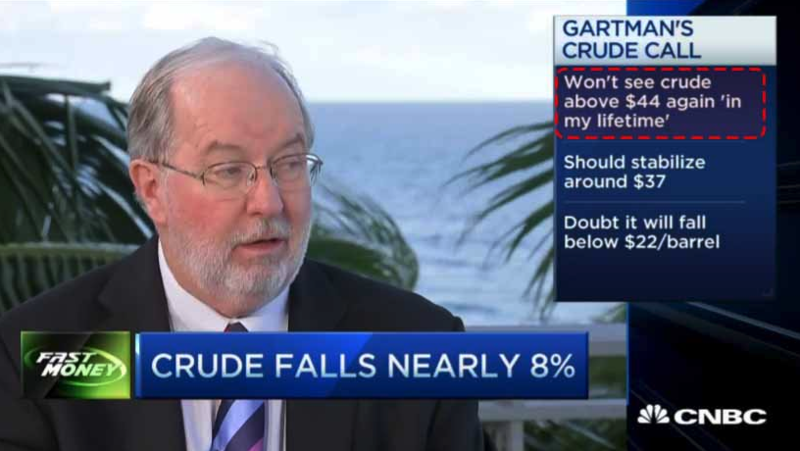 In mid-January 2016, “famous” financial writer Dennis Gartman proclaimed that we wouldn’t see crude oil above $44 again in his lifetime. Early January 2016 was a very bearish period for crude oil prices. The price of oil had fallen nearly $10/barrel during the first two weeks of the year. A two week period of weak prices shouldn’t be extrapolated over the rest of one’s lifetime. This is an example of dangerously narrow-sighted thinking clouded by the recency bias. I will be the first to admit that it’s easy to criticize someone when you have the benefit of hindsight. In a world as uncertain as commodity prices, it’s a natural tendency to gravitate towards someone who seems to have “inside knowledge” by making confident claims of future price direction. Fight the urge to gravitate towards false certainty. It’s your job as first-class farm operator to have a solid B.S. filter in place that allows you to filter through this noise. You need to make the best possible decision for your farm. Regardless of what someone else says is going to happen to prices. Let’s look at a more recent farm-related example I came across in article discussing low winter wheat prices in Kansas. Click here to read the story. On a side note, the story is worth ready for their shocking misunderstanding of basis. Three or four years?! 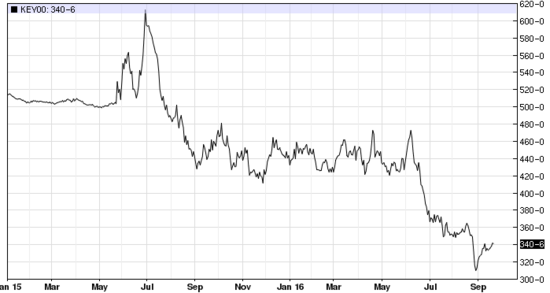 Wheat prices were nearly $2/bushel higher 14 months ago. See the chart below. It’s easy to think that these terrible prices are here to stay but the odds are high that they won’t. Another key point is to get your farm in a position where these periods of low prices are less uncomfortable to you. We know that typically harvest is a seasonally weak time of the year for both basis and futures prices. Get in a position where you don’t have to sell (or pay to store) grain during this period. And maybe more importantly, during periods of seasonal rallies you need to respect the markets ability to go much lower than you think is possible. 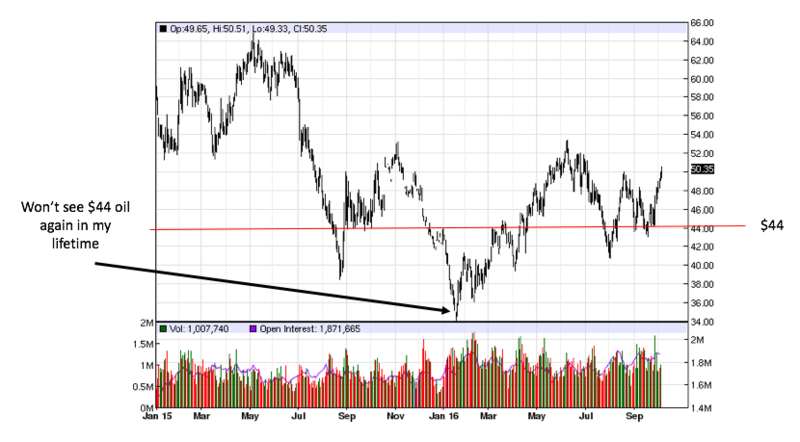 It happens over and over in commodity markets. See the above mentioned winter wheat situation. All-in-all, grain marketing is the definition of an emotional roller coaster. Focusing on your bottom allows you to remove some of this emotion. Find a system for you to remove the emotion such as a spreadsheet tracking tool, our software, or a competitor’s software (no, just kidding, use our software!). Click the button below if you’d like to try out a live account of our software. Remember that farming is a commodity business and commodity businesses are cyclical. Respect the cycles! Dislaimer: This is not a solicitation to buy or sell commodity futures or options on futures. All examples given are strictly hypothetical and neither the information, nor any opinion expressed, constitutes a solicitation to market commodities, to buy or sell futures, or options on futures. Past performance and results are not indicative of, nor do they guarantee, future performance. Commodity marketing has inherent risks. Trading and/or marketing decisions, as well as any gains or losses thereof, are the sole responsibility of the commodity owner, producer, and/or account holder. Harvest Profit,Inc., Market Wise Ag. Services, LLC, it’s principals and employees, and Midwest Hedging, LLC, assume no liability for any use of any information contained herein.